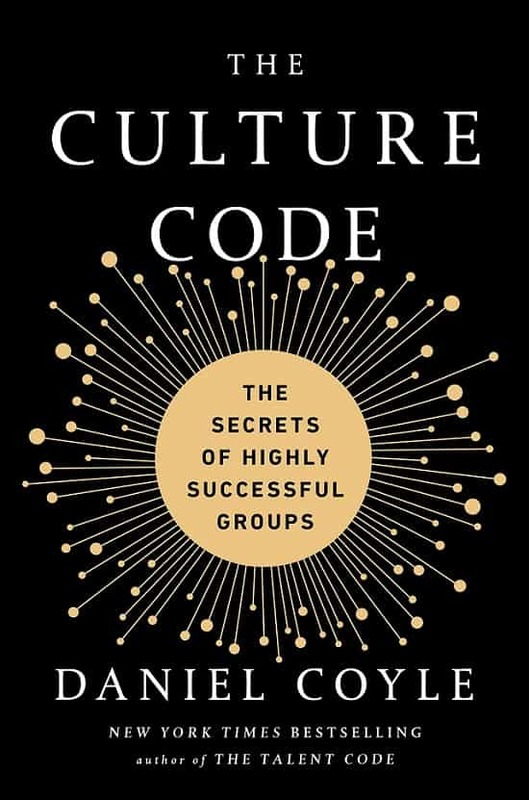 “The Culture Code: The Secrets of Highly Successful Groups” is all about how leading organizations, teams and cultures get to be world-class. This is a review of the book and applications for swim coaches and teams. The book aims to sort out what separates the best teams and organizations from those who never seem to click. It seeks to discover why some groups can be greater than the sum of their parts while others never seem to meet their potential. 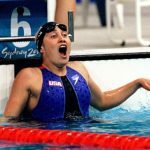 The benefits and implications of building and developing a winning culture are obvious for swim coaches and programs. 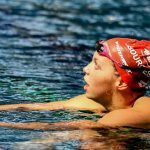 With better culture comes greater buy-in, better recruiting opportunities, higher satisfaction among swimmers and parents, and of course, better results in training and competition. I tore through the book over a weekend, writing notes and thoughts and highlighting key passages along the way. This post covers some of the “ah-ha” moments I had while reading the book. 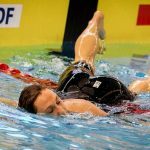 I’ve elaborated and commented on some of Coyle’s thoughts and points as they relate to implementing into your own swim program. 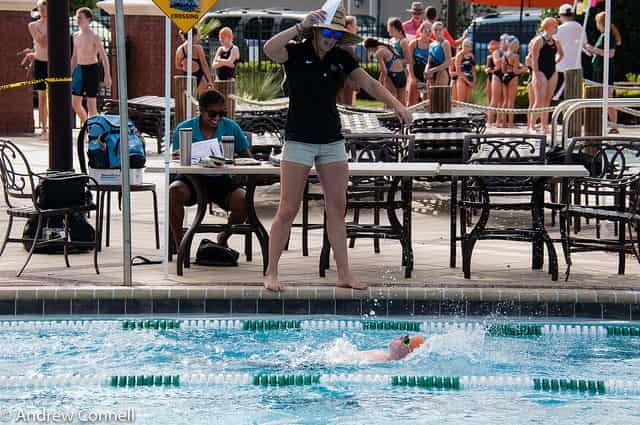 What results is a pretty good starting set of principles for how swim coaches can develop a high-performing culture and program, regardless of whether you are a small program with a couple dozen swimmers or a super-club with satellite teams all over the county. 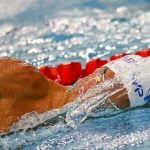 If the author’s name sounds familiar, it should—Daniel Coyle is the author of “The Talent Code” and “The Little Book of Talent” (which is on our list of books that competitive swimmers should read). A high-performance team culture can feel like something that is mythic or tough to describe. Although we know it when we see it and know it when we experience the effects of it, defining exceptional culture can be elusive. The group was also admired or considered best-of-the-best by others in the industry. In his research Coyle determined that the best groups, regardless of industry, market, goals, or competition, all shared a set of skills: They build a sense of psychological safety among team members, share vulnerability, and establish meaningful and consistent purpose. Part 1: Build a feeling of psychological safety. When researchers injected a confederate into a group or team who inhabits one of a series of negative archetypes every swim coach can instantly recognize—the Slacker, the Downer, and the Jerk—performance consistently dropped in every group and company they tried it with. The performance slide was significant, averaging a whopping 30-40%. Yeesh. Safety (outside of the literal physical definition) isn’t usually thought of when team culture is discussed. Culture is typically predicated on a shared goal or purpose (still critical, and this topic comes up later in depth). 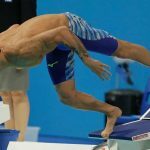 Are swimmers allowed to fail without reprisal? Do they have a safe environment to try to accomplish something great without the worry of looking stupid or like a try-hard? 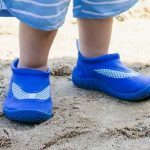 Will they be ridiculed by teammates, coaches or even parents if they try to stand out and excel? Being honest and open about the challenges and difficulty ahead. Big goals are great but being open about the work and the struggle required balances out expectations when adversity happens. Swimmers grow close during their shared quest to become their best. This bond is grown from a shared and relatable struggle. The basic small pleasantries which often go overlooked (thank you’s, filling up a teammate’s water bottle, etc). In other words, you can be telling an athlete their technique is off or that you have complete and utter belief in them, but the content of the message is nothing compared to the cues used when delivering it. Psychological safety needs to be reinforced repeatedly. Like any type of relationship, having swimmers know they are safe requires repetition. Although telling somebody once that you believe in them seems like it’s enough (I’ve said it, and it’s true, so it should be enough), we both know our brains aren’t that easily convinced. Safety needs to be repeatedly demonstrated consistently over time. Coyle discusses the story of a call center that was trying to find ways to decrease their employee attrition rate of 50-70% over the first year of employment. It’s not an easy job—you are usually on the receiving end of someone’s bad day, so a high attrition rate was expected. The call center tried adding a one-hour interview where employees were asked about what special skills they had, or what kind of things that made them unique to handle challenges. They also received a sweater with the company logo and their last name stitched on it. Compared to the “as usual” group of trainees and employees, those who received the additional hour of what were essentially belonging cues were 157% more likely to still be at the call center after seven months. Reading about the power of belonging cues and psychological safety might lead us to think that successful organizations are super cheery places. Not necessarily. Negative feedback is fundamental for group member growth. Greg Popovich is one of the most successful coaches on the planet. His teams have won five NBA championships and he has become legendary for the high-performance culture his teams possess. A relentless approach to providing belonging cues that develop trust and safety with his athletes. These include building connections with his player with body language and behavior (“I care about you as a person”), honest and sometimes pointed performance feedback (“I have high expectations for you”), and a wider perspective on life and interests (“Life is bigger than basketball”). ISHOF inductee and legendary Indiana coach Doc Counsilman discussed his fundamental purpose as a coach as being able to “help athletes meet their basic, individual psychological needs.” The science, the technique, and the results could only come once that foundational need was established. Overcommunication of listening. Posture, expression, questions. Not interrupting or talking over others. Admitting fallibility early on. It’s natural to want to hide our weaknesses or shortcomings. Ask for feedback and input. Don’t shoot the messenger. Bad news happens—resist the urge to lay waste on those who deliver it. They need to feel “safe” to deliver honest (aka bad) news again in the future. Gratitude, gratitude, gratitude. Thanking promotes cooperative behavior. During his reporting Coyle found that there was almost an “over the top” amount of thank you’s from top leaders. Hire carefully. Membership alone is “the most powerful signal any group sends.” Talking a big game is one thing but hiring and training should match expectations. Identify bad behaviors and eliminate bad apples. Every program eventually has the swimmer or swimmers who drag the group down. Whether it’s complaining, rebelling against doing the set properly, being down on everything, or cutting corners, this kind of behavior is stunningly contagious. In group settings motivation will almost always sink to the level of the bad apples, sending team performance hurtling south. Collision-rich spaces. 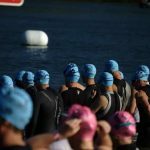 Avoid training swimmers in isolation of teammates; the more team members “collide” the deeper the sense of cohesion becomes. Clean the trash. John Wooden, 10x NCAA champion at UCLA, was already a Hall of Famer when he was found cleaning the trash off the locker room floor after a game. Ray Kroc, the man who took McDonalds to unprecedented heights, swept and hand-picked garbage outside his restaurants. The All-Blacks, New Zealand’s revered rugby champions, “sweep the sheds” after each game. Leadership requires having what Coyle refers to as “muscular humility”—finding simple ways to make the group better. You are the leader. You are the standard. Use threshold moments of belonging. Successful teams and cultures develop moments to demonstrate purpose. Acknowledge new swimmers—this is the moment they are most ripe to accept belonging cues. Give bad performances better feedback. When it comes to giving feedback and criticism, focus on elevating expectations and belief versus a standardized positive-negative-positive sandwich that tastes like garbage. Of course, sharing vulnerabilities is more about the person who is hearing them than giving them. The idea is that they pick up on it and are willing to reveal their own weaknesses as well, as opposed to pretending like they don’t have any. When this willingness to be vulnerable ripples across the team, “You can actually see the people relax and connect and start to trust,” says Dr. Jeff Polzer, a prof at Harvard who researches and teaches organizational behavior. Vulnerability boosts willingness to cooperate. It can be hard for swimmers and coaches alike to sit down and honestly evaluate performance. Announcing our shortcomings is never easy. It can be ugly. When things go wrong—and they certainly do—acknowledging where we failed ourselves and the team can be painful. A successful culture allows for enough vulnerability to happen that honest evaluations can happen. In recounting the after-action reports (AAR) that Navy SEAL units engage in after a mission, Coyle notes that the team members ask questions that while initially painful or uncomfortable, eventually lead to better performance: Where did we fail? What did each of us do, and why did we do it? What will we do differently next time? The forum needs to be safe. More humility, less pulling rank. Evaluation is more effective when someone can come around to a point where they can say, “I screwed that up” on their own. A coach should be asking question after question. Why did you slow down here? Why did you look nervous behind the blocks? Why didn’t you stick to the race strategy? Did you hold back too much on the front half of the race? What can we do differently in training to better prepare? The point is to get swimmers to be able to see what really happened, to get that self-awareness on their own. Doing this gives them a sense of control moving forward—knowing what to change and that they have power to make change is empowering and motivating. This process isn’t always pretty, especially for athletes (and coaches) unaccustomed to this kind of prodding. Ego and hurt feelings are involved. Emotions are running high. Which goes back to the importance of feeling safe. Anybody have any ideas? (Signals that you don’t have all the answers and that you value input.) Attaching phrases that open up for questioning and possible cooperation: Anyone have an idea for how we could make this practice even more effective? Can anyone think of a way to improve endurance on the last lap of a 200? Micro-events of hardship build cohesion over time. The “we got through this together” mindset is legit: bonds are created during hardships in training. You can’t fake the shared experience of completing a week of grueling sets and workouts. The secret to the tightness of the Navy SEALs is found in a long list of “micro-events” that happen during training and is one of the reasons that you often see them running six men to a log for hours on end. Each time a member slips, the others in the team compensate and adapt. This micro-event repeats itself countless times, building up a big inventory of cohesion and trust via repetition and time. Ask for feedback. A Google engineer shared a quick set of questions leaders should be comfortable asking his or her people: What am I currently doing that you’d like me to continue doing? What is one thing I don’t currently do enough you think I should do more often? What can I do to make you more effective? These questions don’t require a lot of time, and almost immediately encourage a cooperative vibe in the group. They will also get your swimmers thinking about things they are/aren’t doing and what they can do to help you coach them better. Emphasize and overcommunicate expectations. Don’t assume that cooperation and vulnerability will happen on its own. Make it clear that this is a team and a culture that welcomes and expects it from its members. Bad news should be face to face. This happens less nowadays with email and texting, but Coyle found that high performing groups delivered bad news in person. Context, body language and empathy are hard to convey in an email or through a smartphone. When building a team, focus on two key moments: the first vulnerability and the first disagreement. These two occasions set the pattern for everything else that follows. Are we about winning interactions, or about learning together? Evaluate and review. Usually the sooner the better, but it’s understandable that this isn’t always realistic when emotions are red-lining. The Navy SEALs frame their after-action reports with five simple questions: What were the intended results? What were our actual results? What caused our results? What will we do the same next time? What will we do differently next time? Getting into the habit of sharing vulnerabilities will help foster a deeper understanding of what works, what doesn’t, and how to improve moving forward. It’s gonna be weird. Accept this. Openly discussing vulnerabilities is not easy, particularly with the looming sense of wanting to move forward (Why are we wasting time reflecting on stuff that went wrong?). Being a little weirded out is normal, particularly the first couple times out running this exercise. Peer coaching. Have swimmers pick a teammate they want to learn from and have them do some peer coaching during a practice (or assign them). Pair up senior and junior swimmers for week long mentorships. Peer coaching is something Florent Manaudou and his teammates at Marseilles did regularly in the lead-up to the London Olympics. The New Zealand All-Blacks frequently have athlete-run practices. Lastly, we come to the biggie, purpose. You’ve probably been waiting for this topic to make its appearance—it’s typically the first thing we talk about when discussing powerful teams and groups. A shared purpose, vision or goal. What are we doing here? What’s the goal? What are we working towards as a team? The purpose of the team should be easy to explain, unique to the group, and simple. A long list of priorities can signify good intent but having a mission statement or purpose for the team that is two pages long quickly becomes overwhelming and confusing. Clarity is key. Inc.com ran a survey asking business owners and executives how many of their employees would be able to list the company’s top three priorities. The executive guessed 64%. When the employees were surveyed, only 2% could name the team priorities and purpose. The environment should reflect purpose. It’s no surprise that high-performance cultures have an environment that matches their expectations and tells a story of success. KIPP schools, wildly popular and successful inner-city schools, name and dedicate classrooms after where the teacher went to university in order to familiarize students with expectations and excellence. The bathroom mirrors have a simple message, Where will YOU go to college? Take a look at the banners that hang in the rafters at the big-name schools. The Hall of Fame pictures that line the hallways. The record boards that list alumni who have gone on to international success. This isn’t bragging: it’s cultivating a sense that success is normal here, and that it can happen to you, too. Mantras, records, banners—they can seem trivial and obvious, but they serve as constant reminders and signals of purpose. The signals act as a conduit for present-day athletes. After all, if all those other swimmers achieved success, the expectation becomes, why not me? A high-performance environment shows an athlete with a series of symbols that easily navigate where we are right now and where we want to go. 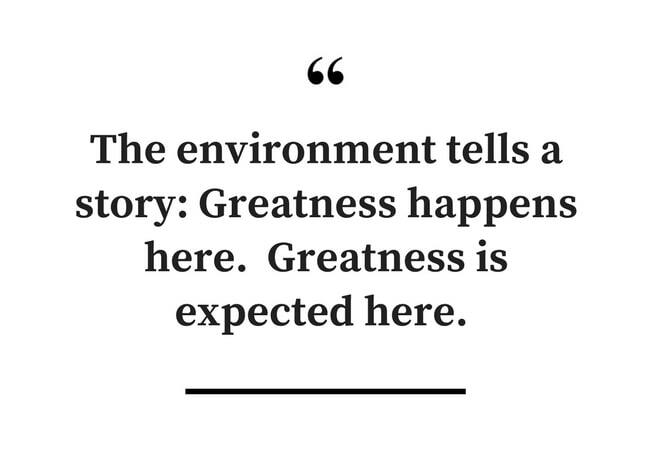 The signal is clear: Greatness happens here. Greatness is expected here. Greatness can happen to you here. What story does the environment tell? When you think about the environment your swimmers are surrounded by each day at practice, what does it communicate to them? What is it telling them, over and over again, about what they are capable of? What’s expected of them? Flood the environment with cues that encourage achievement of the goal. Purpose happens when you focus on particular culture-setting behaviors. You’d be hard pressed to find a coach that doesn’t want epic team culture. Saying you want it is easy enough but translating that desire into actionable and measurable behaviors is another thing altogether. Each hockey game features around forty back-checking opportunities. The coach, Rand Pecknold, emphasizes that his players go all out on each back-check. Not some, not a few, every single one of them. How can swim coaches extend this into the pool? Be the team that finishes every race strong. Be the team that is the first one on deck. Be the group that supports one another whether it’s a C-final or lane four at the Olympics. Coyle’s book is a fantastic read. It’s a breezy read, as well. The Culture Code is a great mix of storytelling, research and studies, and actionable advice and tips that coaches and administrators can use to better their organizations and teams. The information is just as relevant for the experienced, Olympic-level coach as it is for the junior assistant age group coach. The principles are simple and timeless. 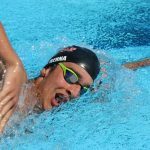 For swimmers, whether team captains or aspiring, it can also be a powerful resource on developing their own leadership abilities. 7 Things Swimmers Can Learn from Nick Saban’s “How Good Do You Want to Be?” Nick Saban is one of the most dominant coaches on the planet. His book, How Good Do You Want to Be? 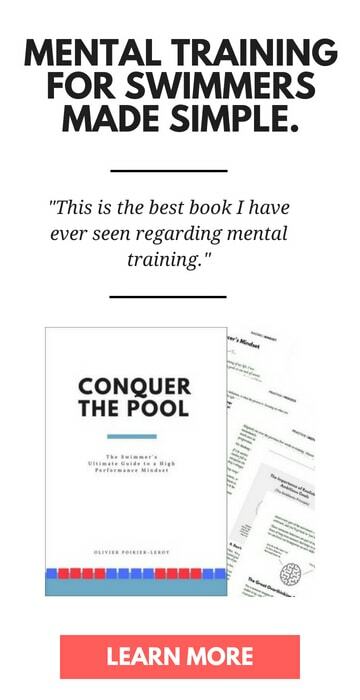 provides a powerful blueprint for success in the water and on the pool deck.